"Over, under, over, under" I say to myself as we worked on our latest paper craft. We've done a few weaving projects before and they can be quite tricky to get the hang of... or maybe it's just me! But weaving is a great activity to work on fine motor skills-- and contrasting colors! 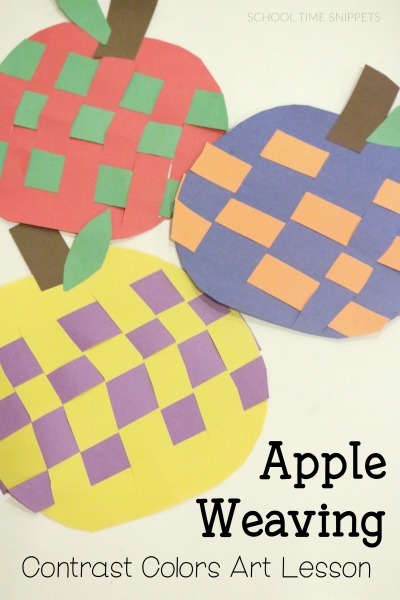 Your preschooler will love making their own Paper Weaving Apple- it's a perfect apple craft for fall! As shared in our curriculum plans for my Kindergartener, I mentioned rowing a book very casually. 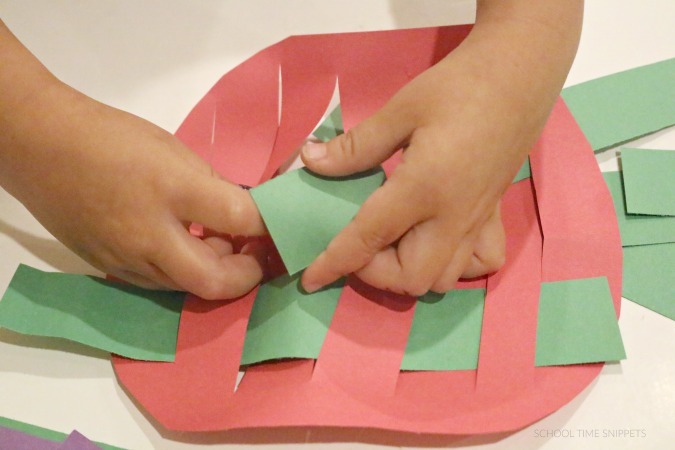 This activity was inspired by the Five in a Row art lesson for the book, How to Make An Apple Pie and See the World . The book suggested talking about contrasting colors, so to keep with our apple theme I set up this activity for my 5-year-old. It helps to have an understanding of the color wheel prior to learning about contrasting colors, so I brought out this awesome color wheel puzzle I picked up from Target a while back. We began talking about primary colors (red, blue, yellow) and how we can mix them to make secondary colors (purple, orange, green), and how we can make even more colors from those! Contrasting/ complimentary colors ''stand out'' from each other. After a brief overview, we began our contrasting colors apple craft! 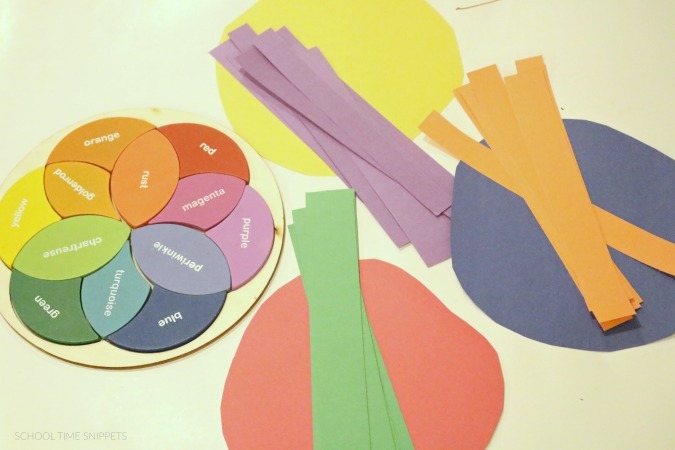 From each color pair above, cut a large apple-like shape in one color, and use a paper cutter to make strips of the other color. Gently fold the apple shape in half and cut slits-- but be sure not to cut the edges. After everything has been prepped, begin weaving the strips under, over, under, over through the apple. Cut off excess paper and add a brown stem and green leaf to the apple. Continue again with the other colors. 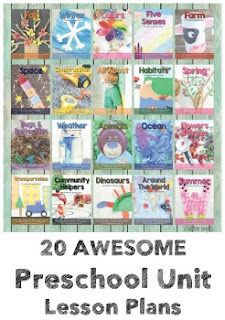 Such a simple project involving so many skills! Enjoy this colorful apple weaving art project and have fun reading, How to Make An Apple Pie and See the World ! 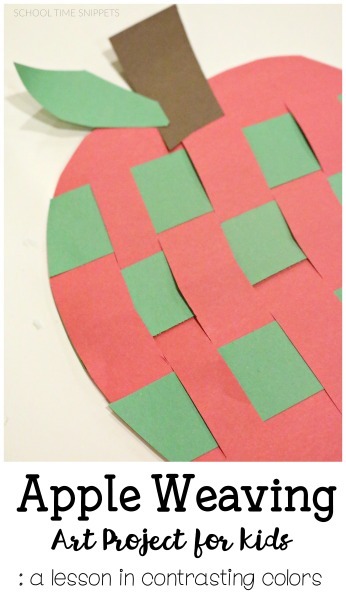 Alternatively, you could do this paper weaving apple craft with any two sheets of paper! Enjoy this apple themed craft!